A view of temperature differences in the cosmic microwave background, generated when the galaxy was less than 400,000 years old, made from nine years of observations from the Wilkinson Microwave Anisotropy Probe (WMAP). Paul Sutter is an astrophysicist at The Ohio State University and the chief scientist at COSI science center. Sutter is also host of "Ask a Spaceman", "Space Radio," and leads AstroTours around the world. Sutter contributed this article to Space.com's Expert Voices: Op-Ed & Insights. The Big Bang model is our most successful explanation for the history of the universe that we live in, and it's ridiculously easy to encapsulate its core framework in a single, T-shirtable sentence: A long time ago, our universe was a lot smaller. From this simple statement flows major testable predictions that have been verified by decades of observation. The expansion rate of the universe. 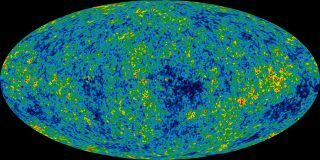 The cosmic microwave background. The production of the lightest elements. The differences between near and far galaxies. All the juicy lines of evidence that makes cosmology a science. The "vanilla" Big Bang model, without any other additions or amendments, can't explain all the observations. We can see a tremendous volume of raw space. Our observable universe is more than 90 billion light-years in diameter. And the farther out we look the deeper into the past we peer. Surrounding us is the cosmic microwave background, the leftover fossil light released when the universe was barely a newborn — only 270,000 years old, well over 13.8 billion years in the past. That light comes to us from distant reaches of the cosmos, so distant that it's now inaccessible to us. And different sections of that background light are inaccessible to each other. In the wonderful jargon of physics, regions of the cosmic microwave background are not causally connected. In other words, for one chunk of the limits of our observable universe to communicate with another chunk in the past 13.8 billion years, they would have had to send signals faster than the speed of light. Which would be no big deal at all if the cosmic microwave background wasn't almost perfectly smooth. The infant universe had the same temperature to one part in a million. How did everyone get so well-coordinated when changes in one area didn't have enough time to affect others? As best as we can measure, the geometry of our universe appears to be perfectly, totally, ever-so-boringly flat. On large, cosmic scales, parallel lines stay parallel forever, interior angles of triangles add up to 180 degrees, and so on. All the rules of Euclidean geometry that you learned in high school apply. But there's no reason for our universe to be flat. At large scales it could've had any old curvature it wanted. Our cosmos could've been shaped like a giant, multidimensional beach ball, or a horse-riding saddle. But, no, it picked flat. And not just a little bit flat. For us to measure no curvature to a precision of a few percent in the present-day universe, the young cosmos must've been flat to one part in a million. Why? Of all the possible choices for curvature, doesn't nearly perfectly flat seem a little suspicious? And indeed, we do suspect that there's a reason for the flatness, and it's not just a lucky roll of the dice. Magnetic monopoles are theoretical beasts; fractures in space-time itself that only exhibit one of the magnetic poles — imagine a north- or south-poled particle wandering around in its lonesome. (In matter as we know it, an object with magnetic north will also have a magnetic south on the other end.) According to our best models of the exceedingly early universe (as in, when it was around 10^-35 seconds old, and no, that's not a typo) exotic process should've absolutely flooded our cosmos with these nasties. These monopoles should be so common that they would be a normal part of our everyday cosmological lives. And yet, we haven't seen evidence for a single one. Zero. Zilch. No monopole monsters appear to be lurking in the brackish waters of the dark universe. So where did they go? They should've been manufactured in abundance just as our universe was getting interesting, but they're nowhere to be found. The best solution we have to these conundrums is a process called inflation. The idea was first proposed — and coined! — by physicist Alan Guth in 1980 when he suggested that the same exotic process that flooded the universe with magnetic monopoles could have sent the cosmos into a period of staggeringly rapid expansion. Imagine if I ballooned you — your body, guts, brain, skeleton, the whole deal — to the size of our entire observable universe. And imagine it took me less than 10^-32 seconds to do it. That's some serious expansion, and precisely what we mean by inflation. When our universe was incredibly young, Guth proposed, it inflated to such gargantuan scales in less than the blink of an eye. For Guth, that was the cleanest route to solving the monopole problem. By making the universe so darn big, the monopoles simply get diluted. Our observable patch of the universe is but one tiny corner of the whole shebang, and there's just so much volume out there that we shouldn't expect to encounter a monopole, like, ever. This inflationary epoch also solves the other two shortcomings of the vanilla Big Bang. The pre-inflationary universe had plenty of time to coordinate and equalize temperatures before whooshing into a much larger state, flinging once-connected regions outside of further contact. And in such a tremendously huge cosmos, we couldn't help but measure a flat geometry in our observable patch. Who cares what the curvature of the whole universe is — it's so big that it will appear flat to us. The Earth is curved, but my backyard is nice and flat, because it's so much smaller than the surface of our planet. Just apply that same logic to cosmological scales and you're golden. Still, the mechanisms underlying inflation are poorly understood, and in order to be considered a halfway-decent scientific theory, it can't just explain current observations but make predictions for future ones. And that will be the story for another day. Learn more by listening to the episode "Why do we need cosmic inflation? (Part 2)" on the Ask a Spaceman podcast, available on iTunes and on the web at http://www.askaspaceman.com. Thanks to Massimiliano S., Lorenzo B., @ZachCoty, Pete E., Christian W., @up_raw, Vicki K., Thomas, Banda C., Steve S., Evan W., Andrew P., @MarkRiepe, @Luft08, @kazoukis, Gordon M., Jim W., Cosmic Wakes, Floren H., Gabi P., Amanda Z., and @scaredjackel for the questions that led to this piece! Ask your own question on Twitter using #AskASpaceman or by following Paul @PaulMattSutter and facebook.com/PaulMattSutter. Follow us on Twitter @Spacedotcom and on Facebook. Original article on Space.com.